Sean Connery is William Forrester, an author unseen in public since penning an acclaimed first novel, who discovers his Bronx apartment has been broken into on a dare by prep school prodigy Rob Brown. 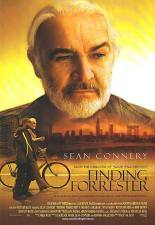 Brown agrees to keep Connery's whereabouts secret if Forrester helps him develop his writing skills, resulting in an unlikely friendship that changes both men's lives in this moving drama. F. Murray Abraham, Anna Paquin also star; directed by Gus Van Zant. 136 min. Widescreen (Enhanced); Soundtracks: English Dolby Digital 5.1, Dolby Digital stereo, French Dolby Digital stereo; Subtitles: English, French; "making of" featurette; deleted scenes; theatrical trailers.